King Mswati the absolute monarch of impoverished Swaziland wore a watch worth US$1.6 million and a suit beaded with diamonds to his 50th birthday party. Days earlier he had received delivery of his second private jet. This one, an A340-300 Airbus, reportedly cost as much as US$30 million after VIP upgrades. These are examples of the King’s lavish lifestyle. He has fleets of top-of-the-range BMW and Mercedes cars and he and his family travel the world in luxury. Meanwhile, seven in ten of his 1.1 million subjects live in abject poverty with incomes less than the equivalent of US$2 per day. 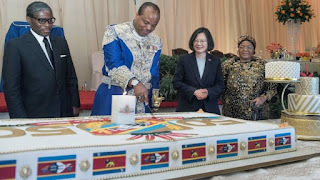 Media in Swaziland, where political parties are banned, are heavily censored and do not report on the excesses of the King and his Royal family. Therefore, it is difficult to determine their full extent, but it has been possible to piece together some of the details. In 2012 he acquired his first private jet, estimated to cost US$17 million. He refused to say who had paid for it, leading to speculation that the money came from public funds. Often, the King abandons his private jet but still travels abroad in luxury. In May 2012 he went to London to attend a lunch to mark the Diamond Jubilee of Queen Elizabeth II. The trip was estimated to cost US$794,500. He took with him his first wife Inkhosikati LaMbikiza. She wore to the lunch shoes trimmed with jewels that cost £995 (US$1,559). It would take seven-out-of-ten Swazis at least three years to earn the price of the shoes. The previous year he was in London with a party of 50 people for the wedding of Prince William and Kate Middlelton, staying at a US$1,000 per night hotel on a trip that was estimated to cost US$700,000 for the hire of a private jet to take the King and his party from Swaziland to the UK. The extravagant spending came just as the International Monetary Fund (IMF) criticised Swaziland for diverting money that should have been used on education and health to other spending. As a result of this spending the IMF withdrew its team that was advising the government on economic recovery from Swaziland. In 2012 Inkhosikati LaMotsa, the second of the King’s wives, stayed at a Johannesburg hotel on a personal trip at a cost of US$60,000 a month. The King has at least 13 wives and they regularly travel the world on lavish shopping trips. Details are kept from the Swazi people, but it is estimated that the trips take place several times a year. In 2016 at least three of his wives went shopping in Orlando, Florida, with an entourage of more than 100, reportedly spending about US$1 million. The cost of this holiday was equivalent to the drought relief that the United States was then providing to the drought-stricken Kingdom. Reports of the trip prompted Lisa Peterson, the then US ambassador to Swaziland, to warn the Kingdom might not receive further food aid from her country because of the Swazi King’s ‘lavish spending’ on holidays. South African media reported that the queens, their bodyguards, protocol officials, family and other ‘support staff’ were on the trip that was expected to last eight days. The City Press newspaper in Johannesburg reported the vacation had irritated diplomats who were motivating for more drought relief aid for the Kingdom, which was in the grips of its worst drought in 18 years. As of the end of May 2016, UNICEF – the United Nations Children’s Fund – estimated 300,320 people in total in Swaziland (nearly a third of the entire population) were affected by drought of which 189,000 were children. A total of 200,897 people were food insecure, of which 90,404 were children. Of these, 8,460 children aged 6 to 59 months were affected by ‘severe and moderate acute malnutrition’. Meanwhile, the Swazi Government had released only E22 million (US$1.5 million) of the E305 million earmarked for drought relief in that year’s national budget. The Florida trip was one of many that were reported in news media across the world, but largely ignored within Swaziland. In 2013, several of the King’s wives –travelled to Japan and Australia on a trip estimated to have cost US$10 million. The King also spends lavishly. In April 2009, the King bought 20 top-of-the-range armour-plated Mercedes Benz S600 Pullman Guards cars for his wives at an estimated cost of E2.5 million (about US$250,000) each and said to be capable of resisting an attack with small arms projectiles, a grenade or other explosive. ‘This was not abuse of taxpayers’ money and the money was not transferred from a government ministry, but these were private Royal funds, the ‘source’ said. When the Times Sunday, an independent newspaper in Swaziland, tried to find out where the money for the cars came from it met a stone wall. The King’s Private Secretary Sam Mkhombe referred all questions to the King’s Office Chief Officer, Bheki Dlamini. However, Dlamini said the cars were not purchased through the King’s Office. He could not, however, explain to the newspaper why they were delivered at the royal residence. The newspaper said at first he did not want to comment on the issue, but eventually said that the King’s Office was not responsible for the cars. However, his subsequent comments fell short of confirming that the vehicles could have been purchased by the King. ‘The King has various accounts that are not run through this office (King’s Office),’ he said. The sources of the King’s income are kept secret from the Swazi people. In 2009, Forbes magazine estimated that the King himself had a personal net fortune worth US$200 million. Forbes also said King Mswati was the beneficiary of two funds created by his father Sobhuza II in trust for the Swazi nation. During his reign, he has absolute discretion over use of the income. The trust has been estimated to be worth US$10 billion. The King also holds 25 percent of all mining royalties in Swaziland ‘in trust’ for the Swazi nation. It reported that MTN, which had a monopoly of the cell phone business in Swaziland at the time, paid dividends directly to the King. He holds 10 percent of the shares in MTN in Swaziland and is referred to by the company as an ‘esteemed shareholder’. It said MTN had paid R114 million (US$11.4 million) to the King over the previous five years. The newspaper also reported that the King was receiving income from Tibiyo Taka Ngwane, which paid dividends in 2013 of E218.1 million. The newspaper reported ‘several sources’ who said it was ‘an open secret’ that although money generated by Tibiyo was meant to be used for the benefit of the nation, Tibiyo in fact channelled money directly to the Royal Family.